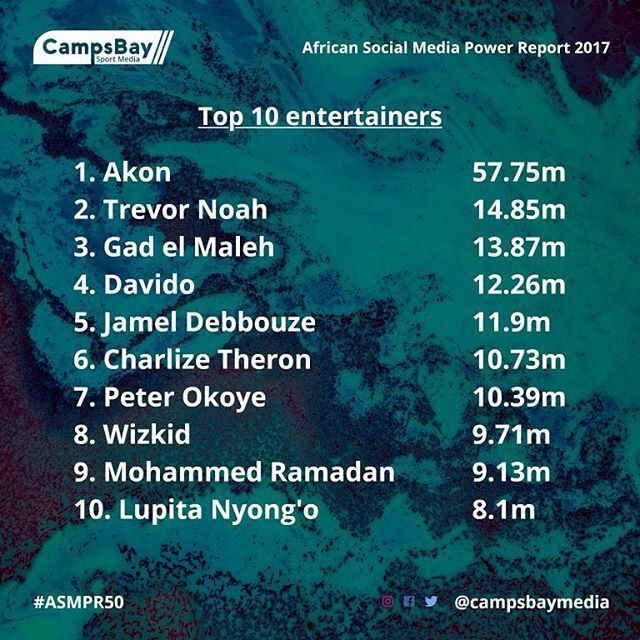 Award-winning musical act, David Adeleke, fondly called Davido leads rival artiste, Wizkid as the most followed Nigerian entertainer on social media according to the African Social Media Power Report 2017: Top 50 Footballers and Entertainers compiled by Camps Bay Media; a sports communication and brand management company. The artistes who put an end to their rivalry last year after performing at each other’s concerts at the Eko Convention Convention Centre, Victoria Island, Lagos in December 2017 have a total of 12.26m and 9.71m followers on social media respectively. Leading the Power 50 list of African footballers and entertainers, ranked based on data from Facebook, Instagram, Twitter is American singer, businessman and philanthropist, Akon. The 44-year-old might have taken a hiatus from the music scene but he is engaging in noteworthy projects. Through his ‘Akon Lights Africa’ initiative, the ‘trouble’ singer is providing electricity to approximately 16 million Africans in 15 countries. “In a world where social media continues to play a big role, the influence of African entertainers and footballers, the crème of popular culture on our continent, continues to fascinate and that is why we have compiled this list. We have tried as much as possible to gather the top African pop and sport stars into the list in order to show their influence across the three key social media platforms of Instagram, Facebook and Twitter. We hope that the Power Report will be an annual ranking to gauge their growing impact as well as enable market planners and researchers to see the possibilities inherent in their influence.” Lolade Adewuyi, chief strategist at Camps Bay Media maintained. The Power 50 has a combined following of almost 400million, a figure that is twice the population of Nigeria, Africa’s most populated country. The 50 comprises of 13 actors/actresses, 14 singers, 9 rappers, 8 footballers, 4 comedians and 2 music producers. Mohamed Salah is the most popular African footballer on social media channels. From an overlooked player to one of Europe’s deadliest attacking stars, the Egyptian’s story is that of strength, determination and tenacity. The Liverpool forward had an incredible 2017 clinching the BBC Player of the Year award beating club teammate, Sadio Mane, Borussia Dortmund and Gabon attacker Pierre-Emerick Aubameyang, Nigeria and Chelsea’s wing-back Victor Moses and, RP Leipzig and Guinea’s midfielder Naby Keita as well as the 2017 CAF African Player of the Year edging out fellow finalists Sadio Mane and Pierre-Emerick Aubameyang. The Anfield king who just became the first Liverpool player to score 25 goals in all competitions this season is working towards his goal of becoming the best Egyptian ever. NextBlogger’s Diary: My First Coca-Cola Bottling Plant Tour! “Hopefully families can learn from what happened to me”. Emmanuel Adebayor addresses family issues again. Louis Van Gaal’s daughter has had enough of Manchester United fans.